You are currently browsing the tag archive for the ‘favorites’ tag. First, a big thank you to all fantasy and YA writers who still bother with stand-alone novels! 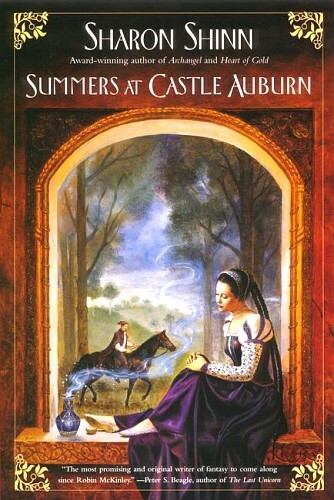 Summers at Castle Auburn continues to be my ultimate comfort-book even this third time around. It’s everything a fantasy YA with a touch of romance should be, and a sure fix for a reading slump. Coriel is the illegitimate child of a powerful lord and a humble herbal healer. Her mother dies when she’s a child, so she’s raised by her grandmother, who teachers her the family’s medical traditions. When the father she never met also dies, her uncle shows up at her village with a proposal: Coriel can continue to live with her grandmother, but must spend her summers at Court with her father’s family. In particular she should learn the ways of nobility with her step-mother and sister Elisandra, who’s engaged to the future King. So start Coriel’s summers at Castle Aurburn. The story begins the summer Coriel’s 14 and follows her coming of age tale. It’s a gentle story about not-so gentle topics. As she grows up, our heroine gradually removes the proverbial pink glasses and starts seeing the people around her in a different light. Coriel’s court is not all about sun and silks and she soon wakes up to harsh realities, like the truth about a faery people called the aliora, prized as slaves for their unfailing kindness even in captivity. There are several very well integrated sub-plots and at no point did I think (as I often do with romantic stories), “Get on with it and show me the next scene where they’re together!” There’s character development to balance the world building and political intrigue to cut the sugary parts. It’s also fun to see how Coriel lives between such different realities without ever really belonging to any. In many occasions Coriel’s innocence borders on the annoying, but it’s impossible not to like her after seeing her use her “commoner” side to successfully live at the Court. But what IMO really distinguishes Summers at Castle Auburn from others of its type is Shinn’s different take on established fantasy/romance stereotypes. For instance, Elisandra could have easily been the naïve-but-annoying type (à la Guinevere or Sansa), or the jealous half-sister who wants all the spotlight. Instead, Elisandra is incredibly loyal to Coriel and her gentleness doesn’t conflict with her moral determination. I’m still surprised this book is not more popular. Maybe as a stand-alone it was eclipsed by Shinn’s more popular series? I’ve never read anything else by her – should I?